How does your smartphone or GPS device know where you are? It's "geospatial" technology that uses satellites and cell signals for mapping apps and location services, but this technology does much more than provide convenience and social media interconnectivity. The technology is creating new opportunities in many fields. Governmental agencies, private corporations and consulting firms are using geographic information systems (GIS), the global positioning system (GPS), satellite-based remote sensing and computer simulations to acquire, manipulate and store geographic information for analysis and decision-making. With its diverse applications across sectors, employment within the GIS industry is anticipated to experience continuous growth in the coming years. According to the U.S. Bureau of Labor Statistics, the jobs outlook for geographers is anticipated to grow 29 percent from 2012-2020. Jobs for cartographers and photogrammetrists are forecasted to increase 20 percent and surveying and mapping technician jobs will grow 14 percent for the same period. "Graduates with degrees in geospatial and environmental informatics can expect to earn anywhere from $40,000 to $100,000 per year, depending on their focus and expertise," said Janaki Alavalapati, dean of Auburn University's School of Forestry and Wildlife Sciences. "They will have a wide variety of career opportunities available to them as specialists, planners, analysts, consultants, resource managers or developers." Recognizing this demand and the opportunity that existed to leverage expertise of newly hired faculty within the Auburn's multidisciplinary Climate-Human-Earth System Sciences (CHESS) cluster, the School of Forestry and Wildlife Sciences tapped Assistant Professors Susan Pan and Sanjiv Kumar to lead the development of a new geospatial and environmental informatics, or GSEI, degree program with other faculty within the colleges of Agriculture, Sciences and Mathematics, Engineering and Business. As the school's director of the GIS and Remote Sensing Laboratory, Pan has applied this interdisciplinary approach toward her studies of a range of topics such as land-use and land-cover changes, climate impacts, mitigation and adaptation and food and water security across many regions of the world including Asia, Africa and North America. "This background has allowed me to use emerging technologies in geospatial modeling, satellite observation and 'Big Data' to monitor, assess and predict multiscale dynamics of coupled natural-human systems in the context of global environmental change," said Pan. "I am excited that my new academic role will provide an opportunity to share this experience with our students." Indeed Pan's laboratory has proven to be a great asset for Auburn students who actively use geospatial technologies and informatics in their work. Having researched land-use change under Pan, former research associate Larry Prince has employed the technological skills he developed at the School of Forestry and Wildlife Sciences to advance his career from GIS technician to distribution engineer representative within Opelika Power Services in Opelika, Alabama. In this role, Prince is responsible for the distribution automation schemes, or smart grid, site development and distribution system expansion. Prince is one of the first implementers within the state for mapping fiber optics for home deployment, which has earned Opelika its status as "Alabama's 1st Gig City." "I use GIS daily to map out new developments, GPS new infrastructure, gather customer data, work on power factor corrections and resolve power outages," said Prince. "All of these things work through our GIS system." Assistant Professor Kumar, also hired within Auburn's CHESS cluster, brings significant expertise in the areas of climate and hydrological modeling to study land and climate interactions and their impacts on availability of natural resources. Kumar's research involves using supercomputers to analyze Big Data—on the order of few terabytes—to study past and future changes in weather and climate, developing and evaluating numerical models to predict availability of natural resources from season to decades and analyzing and communicating underlying uncertainties to decision makers. "Geospatial technologies are essential tools for research, which allows faculty, students and research professionals to geo-reference and analyze a disparate array of environmental data and long-term climate information to better understand and predict ecosystem dynamics on a local, regional and global scale," Kumar said. Ecosystem models can then be created with the input of data, such as climate condition, land-use and land-cover type and waterways. "Geospatial and environmental information technologies, such as GIS, help me to analyze model outputs, demonstrate and predict results and create figures for my research publications," said Jia Yang, research fellow. Yang added, "Given its many uses, I not only see its benefits for students within forestry, wildlife and natural resources-based enterprises, but for students in other fields as well." "The GSEI degree is designed to bring together scientific knowledge and expertise across multiple fields including ecology, agriculture, business, geosciences, climate science and civil engineering," said Scott Enebak, associate dean of academic affairs. "This interdisciplinary approach assures our students will be competitive in a rapidly growing and diverse job market." "Non-declared Auburn students are invited to explore the applications of these technologies, as well," Enebak said. "Courses such as Digital Earth and Intro to Environmental Informatics are available to all students and do not require any prerequisites." More information about the geospatial and environmental informatics degree and related courses is available on the School of Forestry & Wildlife Sciences website. 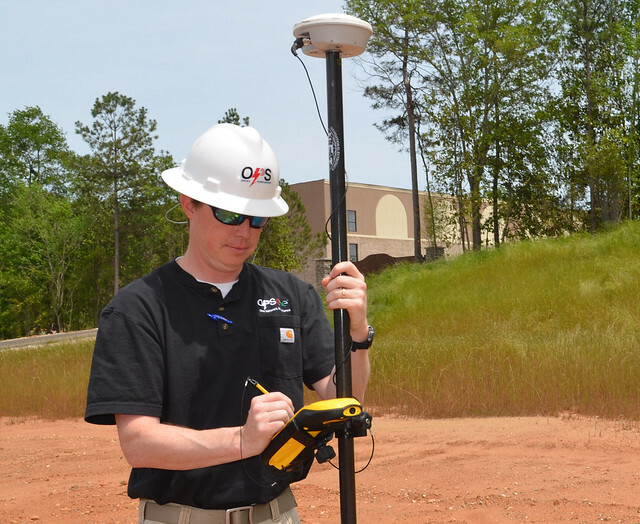 Larry Prince, former Auburn research associate and now a distribution engineer representative with Opelika Power Services, uses a GPS device to plot fiber optics and electrical services. The School of Forestry and Wildlife Sciences has launched a new degree in geospatial and environmental informatics, or GSEI. Auburn’s School of Forestry and Wildlife Sciences has launched a new degree in geospatial and environmental informatics, or GSEI. 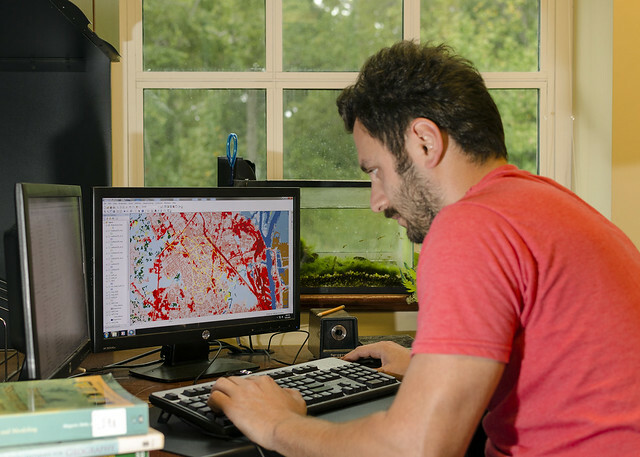 Natural Resources graduate student Enis Baltaci uses geospatial technology to combine digital maps of land use/cover and soils to identify runoff generating areas to help solve the local flooding issues near Mobile, Alabama. 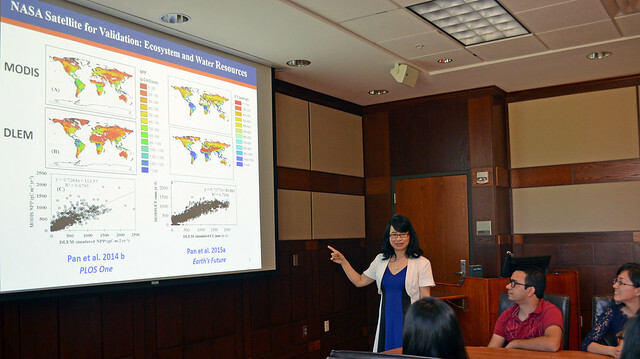 Assistant Professor Susan Pan of Auburn’s School of Forestry and Wildlife Sciences teaches about geospatial and environmental informatics using satellite data to depict global ecosystems and water resources. Auburn’s School of Forestry and Wildlife Sciences has launched a new degree in geospatial and environmental informatics, or GSEI. The university’s supercomputer will help researchers to run past, present and future climate simulations, analyze very large data sets and manipulate global satellite data and imagery. Pictured, from left, are Assistant Professors Sanjiv Kumar and Susan Pan and Research Associate Jia Yang, who are shown studying climate model outputs from Auburn’s supercomputer.